This is an artistic image I took at during Roma's Hospitality Centre wedding photo shoot. It has become one of my habits to attempt a new technique or concept every time I photograph a wedding. The day before the wedding, I put together storyboard and outline a list of must have shots. 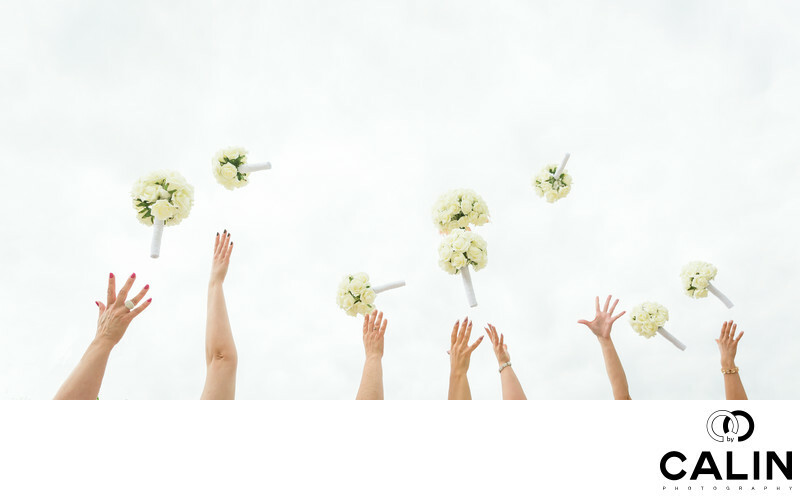 This creative wedding photo shows the bridesmaids and the bride throwing their bouquets in the air. What makes this a striking image is that you cannot see the girls faces, but only their hands and the bouquets. According to the Gestalt simplicity rule, a plane backdrop makes the subject stand out. To create this outstanding photograph, I asked the bridesmaids to stand tall and I drops to the ground to shoots from a low angle. That allowed me to capture their hands and bouquets against the sky. The simplicity of the image, the different hand poses and bouquets positions, doubled by the fact none of the faces is visible, increases the tension in this image. Post processing the shot took a lot of work because despite the low vantage point, I was still able to see the trees behind the bridesmaids' hands. As such, I had to remove those trees in Photoshop. One of the most challenging aspects in creating this photograph was setting the correct exposure. Because I was shooting against a bright sky, the camera's meter was fooled and underexposed the picture by two stops. As such, I had to overexpose by two stops to achieve a properly exposed image in camera.